Argo is based on a true story, know as The Canadian Caper, about a revolution that happened in Iran in the late 70s and American Embassy was overtaken. Some of the workers there escaped and went into hiding at the house of a Canadian diplomat. The CIA worked with the Canadian gov to stage a rescue. They would pretend to be a group of film makers from Canada going to Iran to scout out a location for a movie...the CIA agent in charge of getting them out was Tony Mendez, played by Ben Affleck. With age I feel like I have developed a severe case of ADHD...I cannot make it through a whole movie, performance or concert without looking at my watch calculating how much more time I have to spend paying attention to said entertainment before I can move my life along. Not only did I not look at my watch every five minutes...I am pretty sure I had my hands over my mouth in stressed out terror for 50% of the movie - so, pretty much any time the story is in Iran. 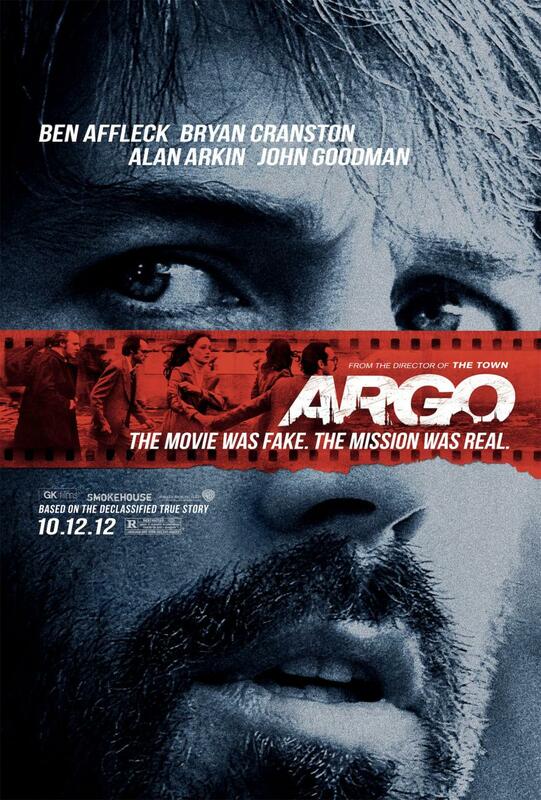 One could cut the tension with a knife during all of the Iran/CIA office parts of the movie, but Affleck gave us a reprieve with John Goodman and Alan Arkin in the roles of the Hollywood guys who provided the cover for the fake movie. What a duo. Hilarious. Then there was Bryan Cranston who played Ben Affleck's boss...at one point I said out loud "You don't f-ck with Bryan Cranston." So...not funny, but awesome. I have been wanting to say this since Gone Baby Gone, but I thought it may have been premature...but I can say with certainty now - Ben Affleck has arrived. I have never hated him as an actor, but as a director...there is a definite award winning future there.